Dubai International Airport (IATA: DXB, ICAO: OMDB) is a major international airport located in Dubai, United Arab Emirates. Dubai International is situated in the Al Garhoud district, 2.5 nautical miles (4.6 km; 2.9 mi) east of Dubai. 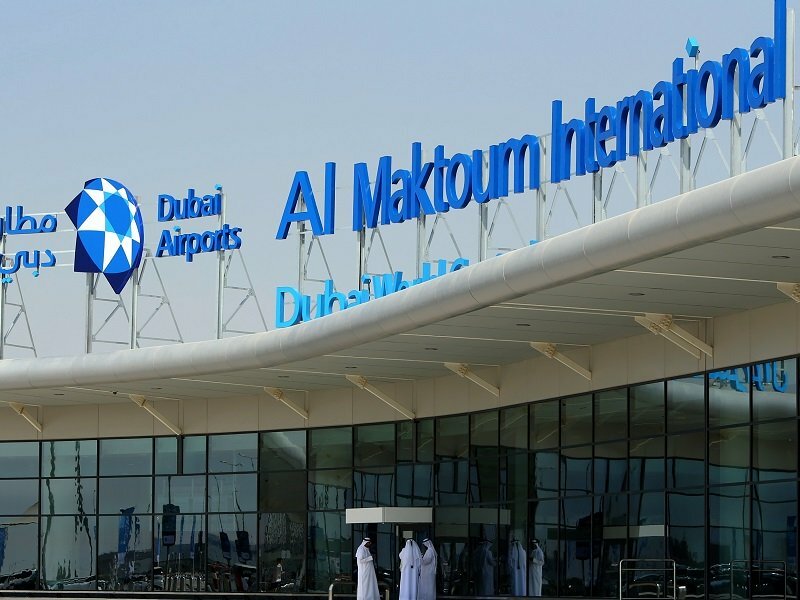 The airport is operated by the Dubai Airports Company and is the home base of Dubai's international airlines, Emirates and flydubai. It is the world's busiest airport by international passenger traffic and it is the 3rd busiest airport in the world by passenger traffic, 70.5 million passengers in 2014. Over 140 airlines operate out of the airport to over 270 destinations across all six inhabited continents. Dubai airport features has three operating passenger terminals and has a total capacity of 75 million passengers annually and serves as a hub for Emirates and flydubai (as a main hub). It is also a hub for Qantas and Emirates SkyCargo. Dubai International Airport has four terminals. 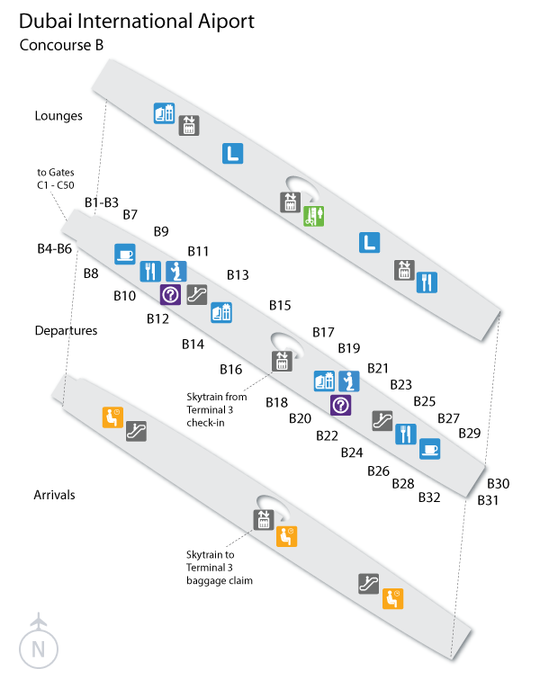 Terminal 1 has one concourse, Terminal 2 is set apart from the other two main buildings and Terminal 3 is divided into Concourse A and B. The cargo terminal is capable of handling 3 million tonnes of cargo annually and a general aviation terminal (GAT) is close by. In 2015, a fourth concourse will open (Concourse D) and will see all airlines currently operating from concourse C shift operations there. 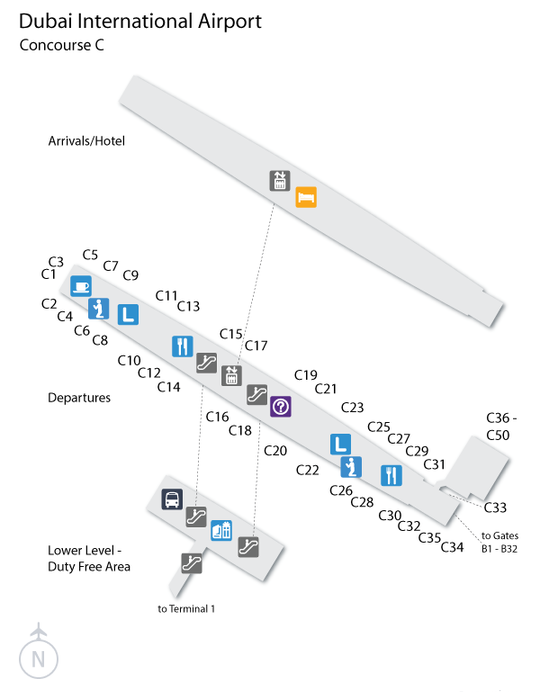 Thus, concourse A, B and C will become part of Terminal 3 and concourse D will be part of Terminal 1. The Dubai Metro and the Dubai bus system are public transportation systems available in the Dubai Airport. Metro : The Dubai Metro system consists of almost 50 stations in the Dubai metropolitan system. There are 87 trains that operate from 6 AM - 12 AM. Bus : The Dubai bus system connects the Dubai metropolitan area and its neighboring communities. Many buses connect to the metro line, providing a comprehensive transportation experience. 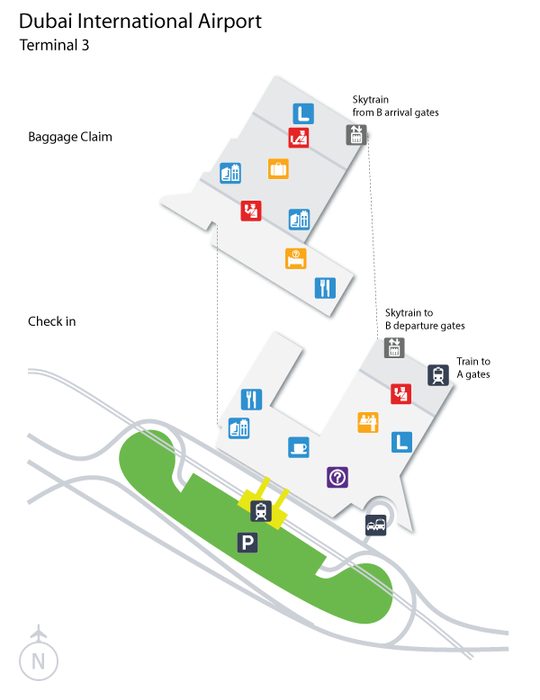 Here's an overview of airport amenities such as Dubai Airport WiFi, famiy, pet care, ADA information and more. Terminal Tram : The Inter-Terminal Shuttle provides a link between Terminals 1, 2 and 3. It operates 24 hours a day. 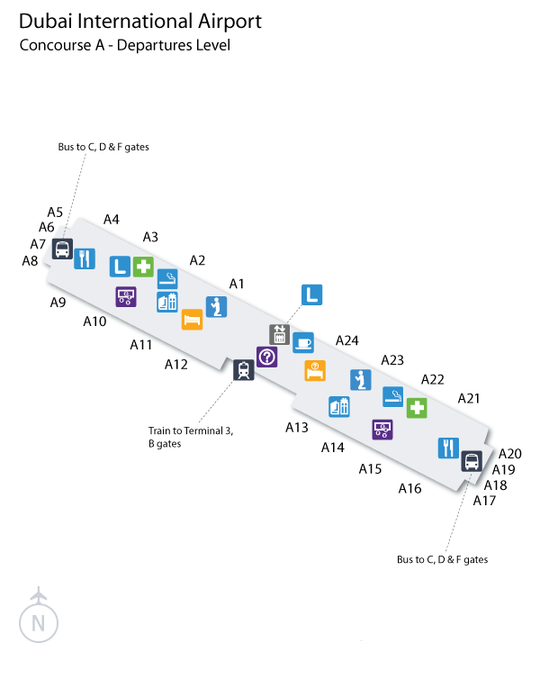 ADA Information : The Dubai International Airport has dedicated desks for passengers with limited mobility located between Rows A and B of the Departures Hall. There are electric carts for transportation to and from the terminal as well as lounges designated for passengers with special needs.